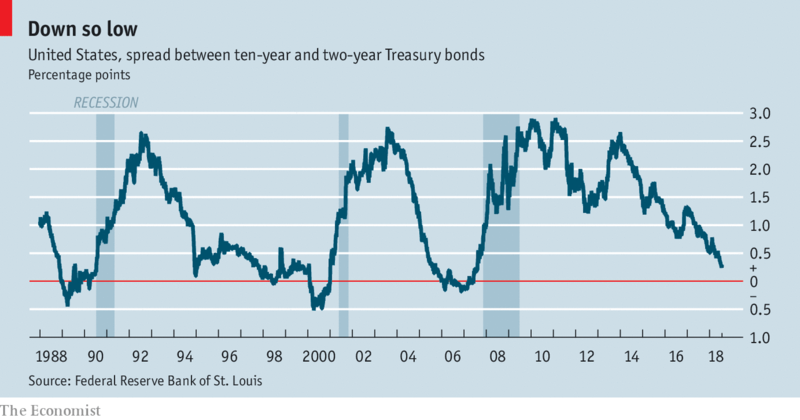 Bond yields reliably predict recessions. Why? AS NAMES for market phenomena go, “inverted yield curve” lacks a certain punch. It is no “death cross” or “vomiting camel”. But what it lacks in panache, the inverted yield curve more than makes up for in predictive potency. Just before each of America’s most recent three recessions the yield curve for government bonds “inverted”, meaning that yields on long-term bonds fell below those on short-term bonds. Economists and stockmarkets seem unconcerned that inversion looms again (see chart). But despite generally strong economic data, there is reason to heed the warning signs flashing across bond markets. There is nothing particularly magical about the yield curve’s predictive power. Short-term interest rates are overwhelmingly determined by changes in central banks’ overnight policy rates—for example, the federal funds rate in America, which has risen by 1.75 percentage points since December 2015. Long-term rates are less well-behaved. They reflect the average short-term rate over a bond’s lifetime, but also a “term premium”: an extra return for holding a longer-term security. An inverted yield curve may mean a few things, none of them cheering. Markets may expect future short-term rates to be lower than present ones, presumably because the central bank has chosen to cut rates in response to economic weakness. Or markets may think they need less compensation for holding long-term bonds in the future. That might reflect expectations that inflation will fall, or that appetite will grow for the safety provided in financial storms by long-run government debt. More generally, the yield curve often inverts when a central bank is expected to switch from a bout of monetary tightening to one of monetary easing. Such transitions often happen around the time a boom comes to an end and a recession begins. The flattening of the American yield curve over the past few years has occurred as the Fed has begun raising its main policy rate, in order to prevent a long expansion from becoming worryingly inflationary. Rate rises will eventually give way to rate cuts, most probably when Fed policymakers begin worrying more about slow growth than about inflation. At that point a recession might be on the cards. Inversion of the yield curve would warn as much. The yield-curve omen is not simply folk wisdom. Research generally concludes that it is indeed a useful indicator of future economic conditions. An analysis by Menzie Chinn and Kavan Kucko, for example, in which the authors examined nine advanced economies between 1970 and 2009, determined that the spread between the yield on ten-year and three-month bonds was a meaningful predictor of industrial activity in the following year. According to a paper in 2008 by Glenn Rudebusch and John Williams (now the president of the Federal Reserve Bank of New York), simple predictive models based on the yield curve are better than professional forecasters at predicting recessions a few quarters ahead. Yet there is also something strange about the enduring power of the yield-curve indicator. A reliable signal that a recession looms should prod central banks into preventive action. That should help avert recession, thereby destroying the predictive power of the indicator. It is possible that this is starting to happen. In their analysis Mr Chinn and Mr Kucko note that the relationship between the signal sent by the yield curve and subsequent growth was weaker in the 2000s than in previous decades. Perhaps central banks are wising up. Or perhaps not. In 2006 Ben Bernanke, then the chairman of the Federal Reserve, expressed scepticism about the danger indicated by the yield curve, noting that he “would not interpret the currently very flat yield curve as indicating a significant economic slowdown to come”. (It did.) When asked about the flattening yield curve in March of this year, Jerome Powell, the current chairman, echoed Mr Bernanke’s sentiment, saying: “I don’t think that recession probabilities are particularly high at the moment, any higher than they normally are.” Awkwardly, whether Mr Powell is right or not depends on how his Fed plans to react to the yield-curve signal. There are two potential reasons why the curve remains a portent. One is that central banks make mistakes. In 2006 Mr Bernanke argued that the yield curve’s signal was distorted by unusual purchases of American bonds by foreign central banks and pensions. 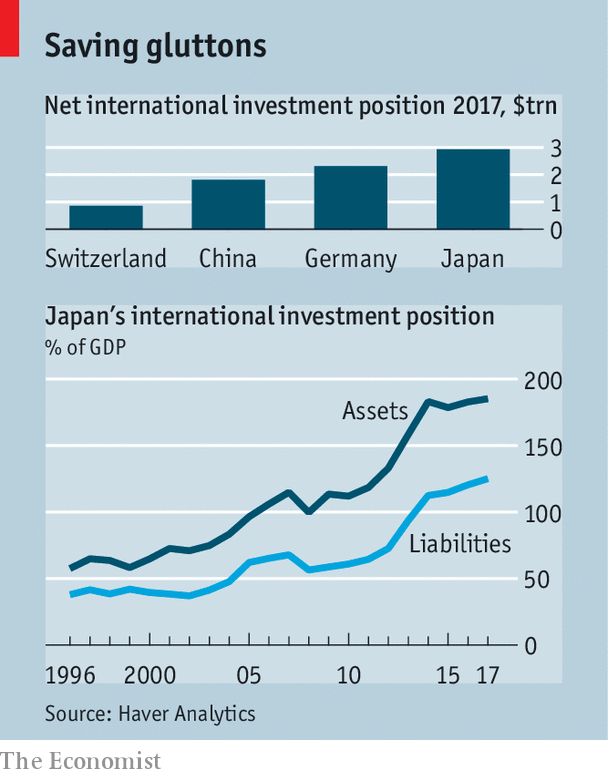 Similar arguments are made today, concerning the effect of asset-purchase programmes by the European Central Bank and the Bank of Japan. Yet just how much distortion is occurring is unclear, and the Fed could easily misjudge the friendliness of the global financial environment. Similarly, central bankers often overestimate the durability of a boom. Recessions happen when central banks overtighten. When such accidents occur, the yield curve inverts. Because the effects of monetary policy are felt only after some time, and because central bankers make mistakes, the yield curve retains its power. The second reason to keep watching the yield curve is that central bankers generally worry more about high inflation than about rising unemployment. It is hawkishness rather than doveishness that leads to inverted yield curves and recessions, after all. The Fed’s own communications make this plain. According to its most recent projections, the policy rate will eventually settle at a level of 2.9%. But in 2019 and 2020 the policy rate will rise higher than that, meaning that cuts will be necessary later. The yield curve, the Fed is advertising, is quite likely to invert. And why? Because, again according to the projections, the unemployment rate is now unsustainably low. A slowing of growth sufficient to bring the unemployment rate back up to what the Fed sees as its natural long-run level—4.5%, rather than the current 4%—is needed, lest inflation rise out of the Fed’s comfort zone. This strategy may well turn out to be a mistake. It will not have been an accident.